Tradition! There is something wonderful about tradition. When I was little I grew up expecting all my Christmas Eves to be similar - Mama and Oma would make borscht (not your typical Ukrainian dish - more a bastardization of that and some other ethnic dish - and very simple - recipe to follow), pirogen, and provide ham and some rolls with yummy sauerkraut inside. Oh, and yes, we had lots of Christmas cookies made by my Oma. My uncles and aunts would come over toting my little cousins. We'd eat and then somehow someone would take us out to search for Santa Claus. By the time we arrived home, he had already come. We always had an artificial tree - sometimes green and once silver with a light wheel that lit it up various colors....that wasn't important. The most important things were the German carols playing in the background, presents, love, and getting ready for Midnight Mass. Fast forward in time. Now that we had our own little traditions, celebrating Christmas on Christmas morn and youngest son's birthday in the afternoon, things became once again comfortable. Enter new to us daughters. Changes. More changes and I conceded I could give up Christmas Day (wondering if hubby ever made that concession) and changed my tradition back to Christmas Eve. 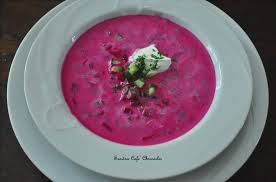 But no one liked the borscht. No one sang carols. And no one went to Mass with me, save my little sister. But it was okay. And this year? A few of my adult children thought it either more fun, less boring, or more convenient to have Christmas on Christmas Day once again. Add to that several had previous engagements, like a job....on Christmas Eve. Little ones needed to be in bed Christmas Eve. So a change was suggested.... This time not at our house. Not using the dishes my grandmother once served on. Not sitting in the same spot where our little ones spent dozens of Christmases. Now the good silver and china will sit vacant in their respective places. The carols will be in the back of my mind. I will still go to Mass, but with only my sister. But the love is still there. The love of my beautiful children. The love for my grandchildren. The peace that there is unconditional love. It will never go away. It can not be bought. It can not be stolen. It will be there for an eternity. Even though my parents and grandparents are no longer on this earth, every day I think of each of them and feel their love in my heart. I hope they feel the love I have always had for them. Their absence this year is only a reminder that this life is temporal. All these traditions will fall away some day. And one day perhaps all I will be is a sweet memory in the hearts of my children and grandchildren. Make pierogen (you can find that recipe on the internet - basically flour, eggs, and a bit of water for the dough; make Romanian hamburgers, fry, and crumble up for the filling). I cheat and purchase ready made pelmeni at the Russian store! Put on a large kettle filled with boiling water. Add the pierogen and when they rise to the top, add two large cans of julienne beets, complete with juice. Add sour cream at the end and you have it. My aunt says that Oma put bouillon in it as well. Maybe, I don't remember.